Just as many predicted, sales figures show that more people are opting to buy e-books rather than printed copies. Sales of e-books rose 167% in June, reports Publishers Weekly, with sales totaling $473.8 million for the first half of the year. But sales of print books -- both paperbacks and hardcovers -- continues to decline. It isn't just publishers that are scrambling to adjust their business models to the growing demand for e-books; so too are libraries having to reconsider how they will provide content for their patrons. Even though there's keen interest on the part of library patrons to check out e-books, making a move to digital loans is not going to be easy. That's true for all libraries, but it's especially true for school libraries, many of which already face budget woes and as such, have to weigh carefully how to invest in new books to stock the shelves. What might be good news for consumers -- your whole library on your cellphone, for example -- might be terrible news for libraries. 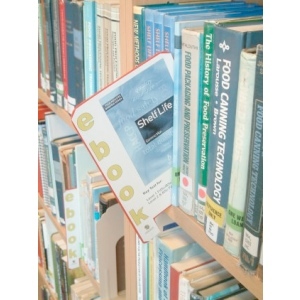 There are lots of considerations libraries must make: which e-reader(s) will they adopt? After all, e-readers are tied to their associated bookstores: Kindle to Amazon, Nook to Barnes & Noble, iPad to iBooks (even though the latter does offer apps for the other e-readers). The e-readers not only have different features (black-and-white screens versus color, for example, touchscreens versus keypads) but their bookstores offer different selections. That's a big consideration when you're looking specifically for children's literature rather than just for general interest ("grownup") fiction or non-fiction. But the biggest problem, according to librarian Buffy Hamilton, author of the Unquiet Librarian blog, is DRM. Digital Rights Management is what restricts content from being shared across devices. It means that e-books from Amazon can't be read on Nooks, and e-books from Barnes & Noble won't work on Kindles. It means, oftentimes, that kids can't bring their own devices from home to use for library check-outs. "The biggest challenge for libraries is trying to accommodate the demand for eBooks in a world in which there is no standard DRM," Hamilton said in a recent interview. "While services like Overdrive provide e-book checkout that's friendly to multiple devices (that could be owned by the library or by students themselves) and allows you to track circulation stats, the cost is prohibitive for many school libraries; in addition, the terms of service with Overdrive no longer provide you an option to move your purchased e-books to another platform should you decide to change from Overdrive to another vendor, which basically means you'd lose your investment in your e-book collection." That's what the State of Kansas faced when it terminated its contract with Overdrive, which highlights the fact that when it comes to digital content, more often than not what we own -- both libraries and consumers -- isn't the content itself but a license to access it. Those licensing rules often restrict lending and sharing altogether, particularly between consumers. But even libraries are finding some of the new licensing policies onerous. The most infamous example of this was the announcement last spring by HarperCollins, when the publisher decreed that an e-book could be checked out only 26 times before libraries' rights to it would be revoked and they'd have to buy another copy. That decision caused outrage on the part of librarians and patrons, and it highlighted that the new world of e-books: What might be good news for consumers -- your whole library on your cellphone, for example -- might be terrible news for libraries. Carolyn Foote, a librarian at Westlake High School in Austin, Texas, says that she thinks about the new licensing rules less in terms of ownership and more in terms of subscriptions. Librarians are already familiar with this model when it comes to access to magazines, newspapers, and databases. Her school invested in Kindles last year and has opted to purchase iPads this year. Foote says her school uses Overdrive and points to its portal for Project Gutenberg titles, particularly as these public domain books don't have licensing and DRM restrictions. "Because of our iPad rollout," she says, "we are focusing on e-books (free and otherwise) that can be delivered via the library to the iPad so that students aren't having to purchase every book they would like to read." Hamilton's school library has experimented with Kindles too, but has opted to purchase more Nooks instead of more Kindles. Hamilton says she particularly likes the Nook's device management program, something that's been designed with the K-12 environment in mind. And that's probably the crux of the problem here: e-readers and e-books have been designed with consumer technology in mind. You own your e-reader. You buy the e-books that you can read on that device. You can't share the readers or the books with anyone else (yes, both the Nook and Kindle allow you to loan a book -- but only once and only for a two-week period.) It's not a system designed for libraries. And it's certainly not a system designed for school libraries. Still, librarians are continuing to struggle to make these devices work in their libraries. They're doing so because they say the kids love them. Their patrons want e-books, and librarians want to be able to meet these kids' demands.